John Ramsey died in Ohio in 1810, leaving his widow, Elizabeth, several children, and some land. John also died without a will. While that was poor planning on John’s part, it actually turns out to be good for his descendants (like me). When someone who owned land dies without a will, the estate needs to take into account all of the heirs so that the land can either be divided among them or sold to another party. Truth be told, you’re sometimes better off having an ancestor die without a will. If he leaves a will, he doesn’t need to name all of his children in it. Die without a will and all of the heirs are going to be listed somewhere. And so it was with John Ramsey. After his death, his widow, Elizabeth, wanted to divide and sell the land. At the time in Ohio, the heirs of the estate would have had to go through a partition suit, where the administrator of the estate would sue the heirs in order to divide it. I haven’t found the partition suit yet, but the resulting deeds shed light on who the heirs were. Top of Perry County, Ohio deed book C, page 189, Perry County Recorder’s Office. “Know all men by these presents that I Elizabeth Ramsey Widow and relict of John Ramsey late of Hopewell Township in the County then of Fairfield now Perry deceased and also assignee of Samuel Ramsey John Ramsey and James Ramsey three of the heirs at Law of said John Ramsey deceased and we Robert Fulerton [sic] and Rebecca his wife and Andrew McBride and Mary his wife (which said Rebecca Fullerton and Mary McBride are also children and heirs at law of said John Ramsey deceased) to Elizabeth Ramsey in hand paid…”1)Ramsey deed, Perry County Deed Book C, page 189, Perry County Recorder’s Office, New Lexington, Ohio. “Heir” does NOT necessarily mean “child of.” It means someone who is legally entitled to inherit from an estate. 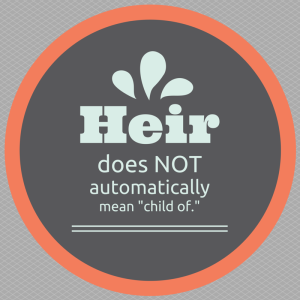 If you write a will, you decide who your heirs are. If you die without a will, the probate laws in effect in your state will determine who the heirs are. A law in 1804 (still in effect in 1810) provided that “if the estate came not be descent, devise or deed of gift, but was acquired by purchase, by the intestate, it shall descent to the children of the intestate and their legal representatives” and “…where one or more of them [children of the intestate] are dead and one or more living, the issue of those dead shall have a right to partition, and such issue, in such chase, shall take per stirpes, that is to say, the share of their deceased parents.” If the intestate had no children, then “the estate shall pass to the brothers and sisters of the intestate of the whole blood, and their legal representatives.”2)Mary L. Bowman, Abstracts and Extracts of the Legislative Acts and Resolutions of the State of Ohio: 1803-1821 (Mansfield: Ohio Genealogical Society, 1994), p. 44. Long story short: if the intestate had children, those children are his heirs. Also, the children of any of his deceased children are his heirs. Only if the intestate didn’t have children would the heirs be his siblings. First, John Ramsey purchased the land in question; that puts the law of descent listed above into effect. Samuel Ramsey, John Ramsey, and James Ramsey were named in the deed as heirs at law of John Ramsey, deceased. Rebecca Fullerton and Mary McBride were named as “children and heirs at law” of John Ramsey, deceased. Since Mary and Rebecca were children, then the other heirs (Samuel, John, and James) had to have been either sons or grandsons of John Ramsey. They couldn’t have been brothers or nephews. Land was important to our ancestors. Since it mattered to them, it should matter to us, because it created some great records. The effort it takes to go through land records is soooo worth it. 1. ↑ Ramsey deed, Perry County Deed Book C, page 189, Perry County Recorder’s Office, New Lexington, Ohio. 2. ↑ Mary L. Bowman, Abstracts and Extracts of the Legislative Acts and Resolutions of the State of Ohio: 1803-1821 (Mansfield: Ohio Genealogical Society, 1994), p. 44. Finding the parents is the ultimate question in genealogy. 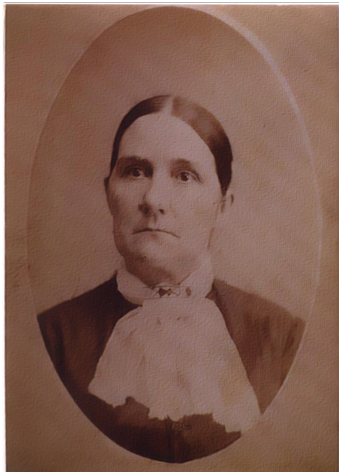 The parents of my great-great-grandmother Susan Tucker should have been easy to trace. But the search for Susan and her origins ended up being the case study I used when I applied to become a Certified Genealogist. Discovering Susan’s maiden name wasn’t difficult. I first found it on the death certificate of Susan’s daughter, my great-grandmother Melzena Kelley Ramsey. 1)Melzena Ramsey death certificate, certificate #41254 (1914), Ohio Historical Society, Columbus. Also available on FamilySearch.org. I had also quickly found the burial place for Susan and her husband John Kelley in Hopewell Methodist Episcopal Cemetery in Perry County, Ohio. 2)Susan Kelley, FindAGrave.com. The tombstone listed Susan’s date of death as 23 February 1914. Bingo! She should have a death certificate and that should name her parents. Susan Kelly [sic] death certificate, Ohio certificate number 10989 (1914), downloaded from FamilySearch. Father: First part name unknown Tucker. Mother: Unknown. Ok. Maybe her obituary has something. Finding that obituary 4)Mrs. Susan Kelly obituary, New Lexington (Ohio) Herald, 5 March 1914 was the shortest Genealogy Happy Dance in history. “Yes! I found it! 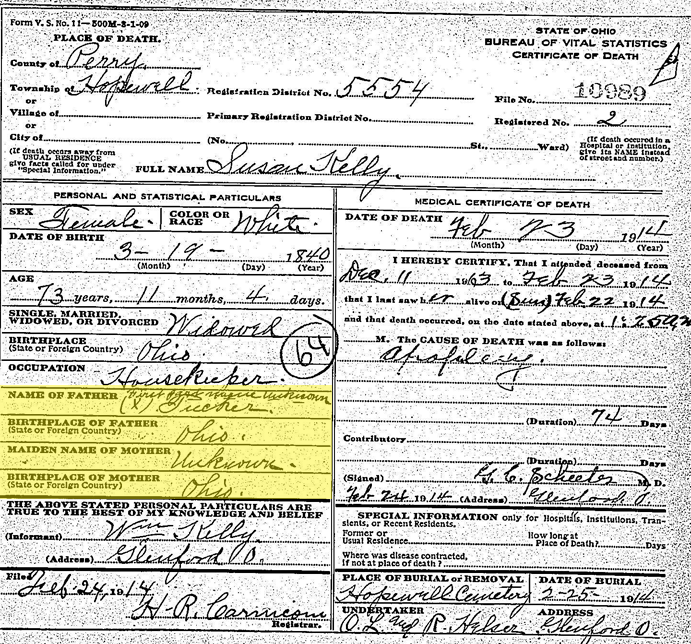 Wait, it doesn’t tell me anything.” What about Susan’s marriage record to John Kelley? John Kelley and Susan Tucker marriage, marriage volume 4, page 231, Perry County, Ohio. Downloaded from FamilySearch. That marriage record 5)John Kelley and Susan Tucker marriage, marriage volume 4, page 231, Perry County, Ohio. Downloaded from FamilySearch. was less than helpful. Hmmm, they didn’t get married until 1863. Susan should be in the 1850 and 1860 censuses with her parents. 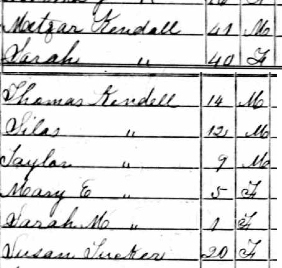 Susan Tucker in Metzer Kindall [sic] household, 1850 U.S. census. I researched the people who I knew were in Susan’s family: her husband John Kelley and their children. After searching through probate, land records, county histories, and other records, I found no more clues as to Susan’s parents. Since they didn’t give me the answers I sought, I turned to the next group of people I had associated with Susan: Metzer and Sarah Kendall. Who were they? Metzer Kendall married Sarah Nixon in Perry County in 1845. 8)Perry County, Ohio marriage volume 2-3, page 117, Perry County, Ohio Probate Court. I found no earlier marriages for Sarah, which seems to eliminate the possibility that Susan was her child from a previous marriage. Susan was not mentioned in any of their probate, land records, or in their biographies in the county history. William W. Tucker married Mary Ann Nixon in 1836 in Perry County.9)Perry County marriage volume 1, page 183, Perry County, Ohio Probate Court. The 1840 census of Jackson Township, Perry County lists a William W. Tucker with the following household:10)William W. Tucker household, 1840 U.S. Census, Jackson Township, Perry County, Ohio, page 130. This looks like a young family – a young husband and wife and three small children. Susan was born in 19 March 1840, so she would fit as one of the females under the age of 5. Following William and Mary Ann, there were no clues in their land records; they sold all land that they purchased, and there are corresponding purchases for all the land they sold. No probate records have been found for them in either Perry or Hocking counties (where they also owned a small amount of land). Further, Isaac Nixon and Solomon Nunamaker were sureties with $100 bond. Now we have even more of a connection between Tuckers and Nixons. Further, the age of the children exactly fit the ages of the children in William W. Tucker’s 1840 household. Also, the age for Susan in this January 1848 record is consistent with my Susan, since she wouldn’t have had her 8th birthday until March 1848. The next phase of research was into Levi Nixon and Isaac Nixon, the guardian and the surety. The History of Fairfield and Perry Counties, Ohio (1883) noted that Levi was the son of Robert and Catherine Nixon. Susan Tucker was the daughter of William and Mary Ann (Nixon) Tucker. Something happened to William and Mary Ann between 1840 and 1848. They had no outstanding property in 1848, so there was no probate. The legal interests of the Tucker children were small, accounting for the small amount of the surety. Susan’s guardian was her uncle Levi, with surety provided by her uncle Isaac. Susan actually lived with her aunt Sarah. No one piece of documentation states that Susan Tucker was the daughter of William Tucker and Mary Ann Nixon, or that Susan was the granddaughter of Robert Nixon. But taken as a whole, this conclusion fits the facts. 1. ↑ Melzena Ramsey death certificate, certificate #41254 (1914), Ohio Historical Society, Columbus. Also available on FamilySearch.org. 2. ↑ Susan Kelley, FindAGrave.com. 5. ↑ John Kelley and Susan Tucker marriage, marriage volume 4, page 231, Perry County, Ohio. Downloaded from FamilySearch. 6. ↑ Metzer Kindall household, 1850 U.S. census, Hopewell township, Perry County, Ohio, page 384B. 7. ↑ Metzar Kendall household, 1860 U.S. census, Hopewell Township, Perry County, Ohio, page 413. 8. ↑ Perry County, Ohio marriage volume 2-3, page 117, Perry County, Ohio Probate Court. 9. ↑ Perry County marriage volume 1, page 183, Perry County, Ohio Probate Court. 10. ↑ William W. Tucker household, 1840 U.S. Census, Jackson Township, Perry County, Ohio, page 130.